Launched from the public boat ramp at the end of West Beach Road. Made it to Watch Hill light. There is a nasty rip there. I almost made it through before capsizing. I have to stop doing that. I spent some time n the water got the kayak to stay up right using the paddle float. But with so much water and weight in the boat when I went to pump more water came in the cockpit than i was pumping out. Called mayday. was talking with coast guard trying to give my position. I hailed a boat going out and he came over. I had him radio the coast guard our position. Another boat came along and helped me pump out. I climbed into his boat and then back in the yak. I had him take me closer to shore as my rudder is broken. I tried to paddle got 3 strokes and went over. I righted the yak and held on to his boat and had him pull me as close to shore as he dared. short swim I could touch bottom. The real fun began when I had to portage down the beach and up a hill and down the other side. I did find a number of young people willing to help me. A number of people told me the yacht club would be willing to help me if I told them what I was doing. I went there and that is where I met Danny. Danny was very helpful we found a pedestal with a 110AC outlet unfortunately it was wired up yet. Danny brought me a couple of large pieces of some delicious chicken. I went back to where I left my kayak and used my laptop to try and charge my phone, I found an unsecured WiFi and was able to contact my girlfriend and make arrangements for a hotel. I wrote down the directions. While I was sitting there I met Kim from the yacht club. She was interested in what I was doing and wanted to know more about the cause and why I was doing it. Finally got a room and crashed from exhaustion. 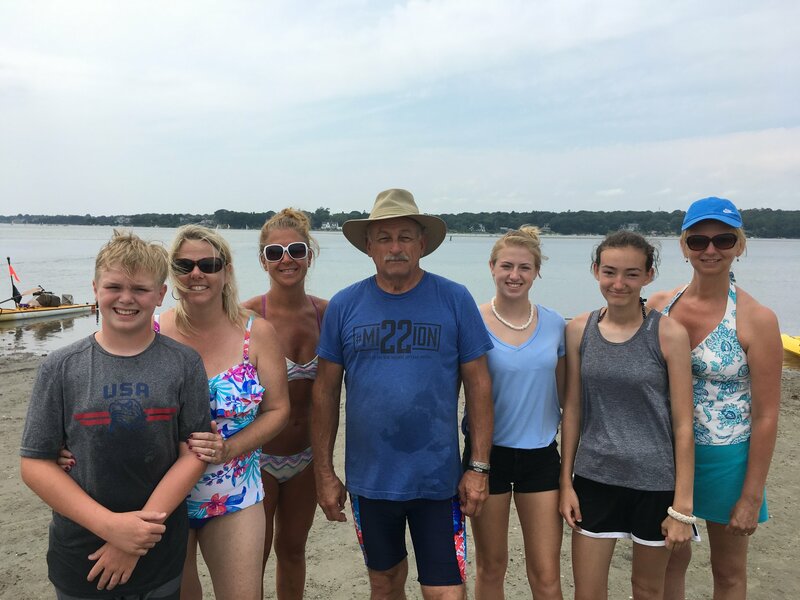 The Quonny beach/boat ramp group. Jim, after weeks of looking at your blog posts, I have to say that I think that you should call this paddle trip quits and find some other way to take Mission 22 forward. While I believe in your cause, I would like to see you safe and having a good time. You have done admirably but you have too many miles of rough water ahead of you. As I said to you on little Chebeague Island in May, you need to set a good example and take care of yourself. How about at least shuttling your boat south to start some place close to your daughters.